They say you can't go home again, but when his cat dies, Stacey "Shakespeare" "Shakes" Williams decides to bring it back to his small rural hometown, somewhere - you guessed it - east of Denver. Things certainly have changed. Shakes's dad is in the throes of dementia, occasionally forgetting that his wife died some years previously. Conversations are repeated. The home is a fetid bowl of squalor. And when his father's caretaker is discovered dead in a locked bathroom (she'd been there for two weeks, but thanks to a disorder that prevents both Shakes and Emmett, his father, from being able to smell, no one noticed), Shakes realizes he needs to stick around for a little while. He reconnects not only with Emmett, but with some friends from high school as well. First is Clarissa, an overweight anorexic with a fear of vomiting, who works in the local bank. Then there is Vaughn Atkins, a paraplegic who lives in his mother's basement. Shakes's interactions with these folks depend on what he needs from them. In the case of Clarissa, it might be feminine companionship, or, more likely, information about Mike Crutchfield, the bank's owner. Vaughn provides comic relief, as well someone more lucid to talk to than Emmett. As his visit progresses, Shakes discovers that his father is beyond broke. He's lost most of the family's land, and he sold his Cessna to Crutchfield for a mere $20. Shakes goes to confront the bank owner, only to be double-talked and left even more confused and hopeless. What can he do to help his father? In a "you steal from me and I'll steal from you" sensibility, Shakes decides to rob the bank. 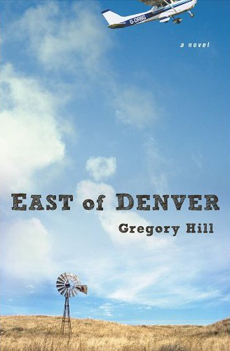 Gregory Hill does an excellent job of creating the lazy, constricted atmosphere of a small town on the edge of ruin. While it appears that Shakes is lucky because he did escape, he's back home, just as ineffectual as everyone else. It seems like nothing good will happen for him or Emmett, and that sense of futility is never greater than when a doctor tells Shakes to feed Emmett fatty foods, because a heart attack beats the slow decline of dementia any day. But not all is bleak. Hill writes some funny stuff in here, and those moments of wit and humor keep you optimistic, even as you know that Shakes and his father face certain doom and misery. Even the dead cat can't rest in peace. There isn't a whole lot of plot in this book. The characters and dialogue drive the story more than the story itself. We never find out what Shakes has been doing since he left home, almost as if because those years away from Dorsey were as insignificant and meaningless as if he had never left. Shakes, it can be assumed, is damned if he did and damned if he didn't. This book won Amazon.com's Breakthrough Novel Award in 2011, and when you read it, you will discover why. It is witty, sad and uplifting.